Amstron replacement APC SYBT2 batteries. 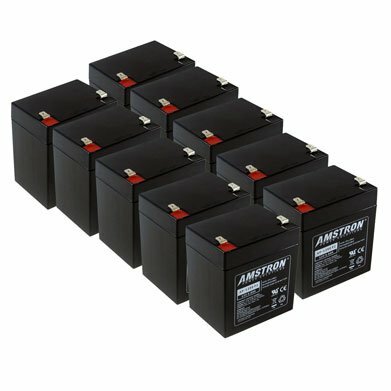 These 12V 5Ah batteries are designed to replace your existing Replacement Battery Cartridge, you will need to use your existing wiring or trays to make a complete unit.Requires existing wiring or tray from old unit 10 batteries ship FeaturesAbsorbent Glass Mat (AGM) technology for superior performance. Valve regulated, spill proof construction allows safe operation in any position. Power/volume ratio yielding unrivaled energy density. Approved for transport by air. D.O.T., I.A.T.A., I.C.A.O., F.A.A. If you have any questions about this product by Amstron, contact us by completing and submitting the form below. If you are looking for a specif part number, please include it with your message.